As these words remind us, many heartwarming memories are created on Christmas day as families gather to reminisce on the year and express their gratitude via gift-giving. What if your Christmas gift to a loved one was–quite literally–a joyful memory? At Paint Your Life, we provide you with the unique opportunity to honor and bring to life the love between family members, spouses, and even pets. Simply submit a photo of your choice to a commissioned Paint Your Life artist that you select. From there, the artist will create a custom-painted, handmade portrait that will preserve these memories for decades and generations to come. After commissioning the creation of such a special and memorable gift, you won’t want to simply hand over the portrait to the receiver. There are a handful of creative ways to unveil your unique handpainted portrait–and in this post, we’re going to give you a few of our best ideas. #1: Create a Scavenger Hunt. What better way to build excitement than to have a good-old fashioned scavenger hunt! Set up a scavenger hunt that leads your loved one to the portrait by leaving clues around the house. Each clue should provide a hint for where to find the next clue, until he or she ultimately reaches the final step and finds their portrait. Take it a step further and expand upon the theme of family memories by writing each clue on the back of an actual photo. Getting the whole family involved–from your 90-year-old grandmother to your 5-year-old niece–will create the perfect opportunity for a fun and engaging group activity. And while you’re at it, capture the memory on video or snapshots. You won’t regret recording having the ability to look back on this special Christmas memory at a later date! #2: Mount the Portrait In Your Loved One’s Home. If your Christmas Day celebration takes place in the home of the portrait recipient, find a place to mount the painting and hide it with a beautiful cloth or tapestry. Lead the gift recipient to the painting and deliver a few thoughtful verbal sentiments about how much they mean to you before you remove the covering. From there, watch the look of surprise and emotion on their face–it may even bring tears to their eyes, as it has for many of our past customers. 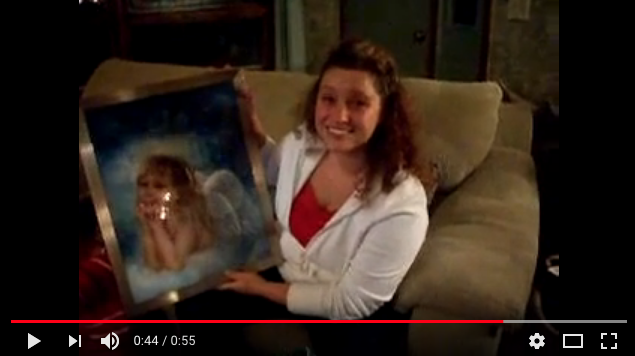 In fact, watch the video testimonial below to see how one such customer reacted to her custom painting. 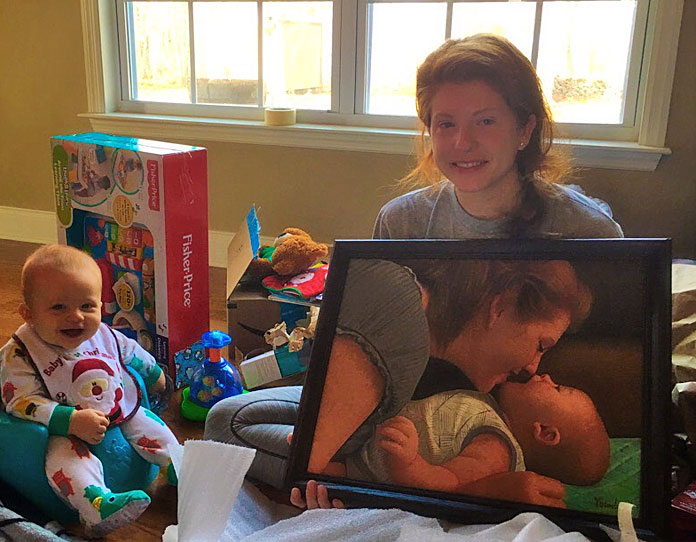 Watch as a Paint Your Life portrait recipient opens her gift! #3: Use the Original Photo in a Creative Way. Present the original photo along with a beautiful handwritten card that describes what the photo and your loved one means to you. From there, encourage your loved one to look around the house for the mysterious match, perhaps providing a few clues along the way. Watch your loved one’s face light up as they discover the portrait. 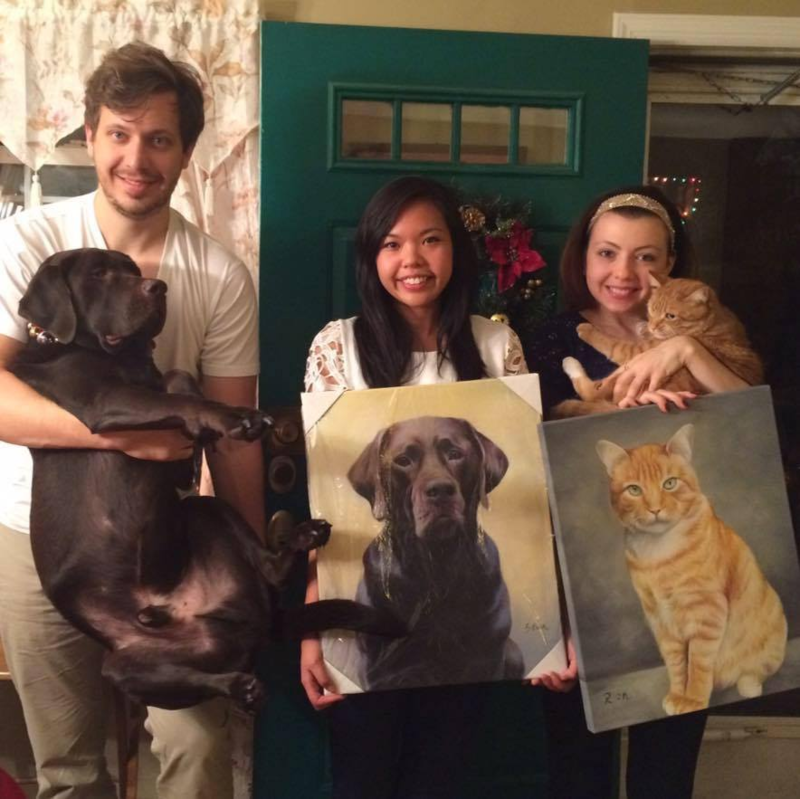 See how the pet portraits below brought smiles to the family members of our customer Thadyne! #4: Get the Kids Involved. Children love creating dramatic presentations for the rest of the family. Perhaps you have memories of putting on a play with your cousins every Christmas, up until you aged out of the tradition. Get the younger generation in your family in on the big gift reveal, and ask them to put on a dramatic production related to the portrait. For example, if the portrait portrays a family group shot while on vacation at the beach, have the children act out the beach vacation. Or, if it commemorates one of the gift receiver’s pets, have the children dress up like that pet–whether it be a cat, dog, or otherwise–and put on a play about a day in the life of the furry loved one. At the end of the dramatic production, ask the children to help you present the portrait to your loved one receiving the gift–he or she will love the fact that you made it a group effort with the help of the littlest ones in the family! 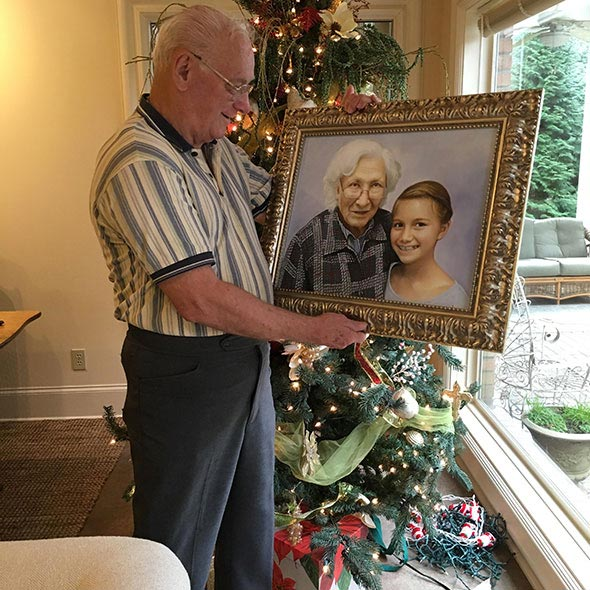 Speaking of the littlest ones, check out the photo below that shows how our customer Felicia lovingly incorporated both her daughter and deceased grandmother in a portrait for her grandfather. This note from Felicia brought tears to our eyes! #5: Write and Perform a Song. Have a knack for songwriting, singing, or playing an instrument? Put your talents to good use and write a song in dedication to your loved one. At the end of the song, include a lyric that ties in with the portrait, or helps you present it. Be sure to film the whole thing–having the song and your loved one’s reaction documented will bring smiles to all for years to come. Giving the gift of a memory preserved for a lifetime is winning gift idea–and deserves an equally winning way of presenting it to your loved one. 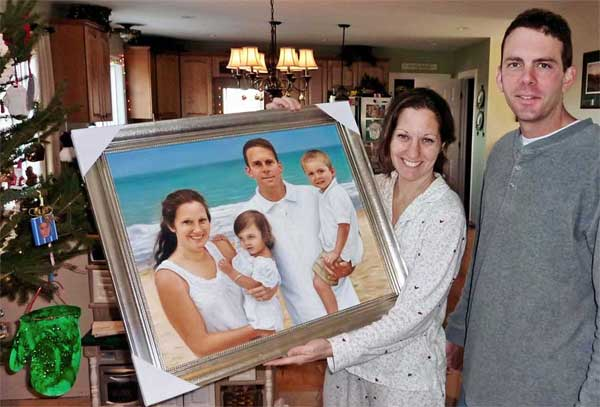 #6: One of the Most Exciting Ways of Gifting a Portrait. Watch One of the Most Exciting Ways of Gifting a Portrait! One thing is, I realized many galleries and museums may not be open on Christmas, so I also suggest that people use this idea to present the gift the day AFTER Christmas if necessary! Whether you select one of the suggested methods above or create your own, make sure that the process of giving the gift itself will be a memory to last for a lifetime. 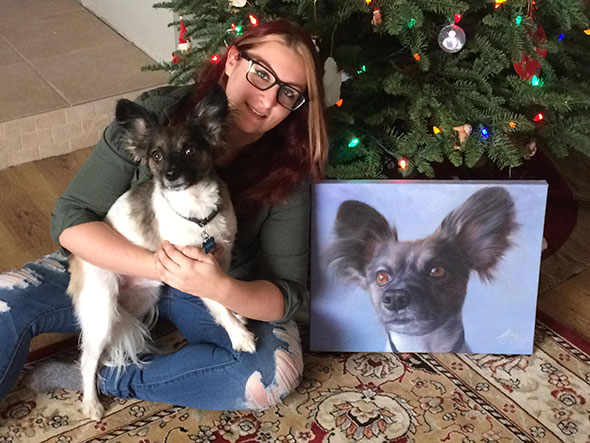 Get your custom portrait order in early to receive the gift in time for Christmas–submit your order now!